SUBHEAD: Hawaii Senators introduce bill to require Fukushima radiation monitoring for at least next 5 years revealed to public. 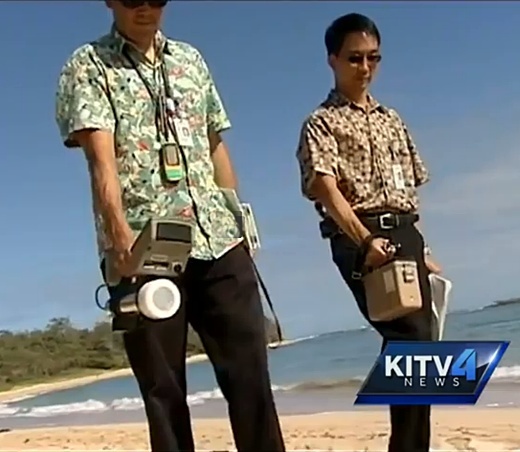 Image above: State workers monitoring radiation on beach in Hawaii. Still from KITV video article below. A Hawaii State Senate Bill SB-3049 (click on link to testify) is currently under consideration. This bill would require the State Department of Health (DOH) to implement a pilot project to monitor radiation levels over the next five years and to post periodic reports on its website. This is an obvious thing to do since the Federal government (NOAA, EPA, DOE, NRC, etc) are not revealing what has happened or will be happening regarding our health and safety in Hawaii due to the Fukushima Daiichi Disaster.Support this bill! Measure Title: RELATING TO RADIATION LEVELS. Description: Requires DOH to implement a pilot project to monitor radiation levels over the next five years and to post periodic reports on its website. 1/27/2014 S Referred to HTH/ENE, WAM. 2/4/2014 S The committee(s) on HTH/ENE has scheduled a public hearing on 02-07-14 1:15PM in conference room 229. 2/7/2014 S The committee(s) on HTH deferred the measure until 02-12-14 1:00PM in conference room 229. 2/7/2014 S The committee(s) on ENE deferred the measure until 02-13-14 2:45PM in conference room 225. Radiation fears have resurfaced and now residents are asking whether the state's doing enough to be sure there's nothing from Fukushima hitting our shores. I just want to make sure what we consume is going to be safe," Adrian Chang is a retired pearl harbor nuclear engineer. He turned out to support a bill calling for radiation testing and voiced his concerns before members of a joint health and enviroment committee. State health officials assured that it has been monitoring our shores since before the earthquake. The testing happens quarterly on Oahu, Kauai and the Big Island. "We have equipment that is so sensitive so we can detect it as miniscule levels that is far far below any public health concern.But the fact we can detect it throws fear into individuals as you are well aware," The state is also regularly testing our air,rain, milk and drinking water. And says levels of any radiation found in fish have been extremly low. But Senator Josh Green wonders if part of the problem is the lack of reliable information for the public. "I had a difficult time finding it and the lastest update was seven or eight months ago"
State health officials say, "Duly noted.". "Sometimes fear is the greatest harm that we have. The impact of psychological concerns that persist if you cant get good answers can actually be more damaging than the tragedy itself," A similar bill introduced in the house was also heard today. The senate committee is to take a vote next week. Back to you.